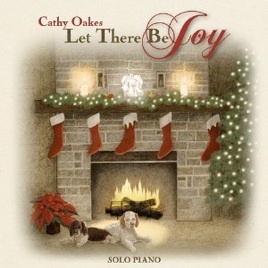 Cathy Oakes is relatively new on the solo piano scene - at least as a composer and recording artist - but she has been making a very positive impression on those who have been listening to her music (including me!). She has released two CDs so far and has three more in the works. 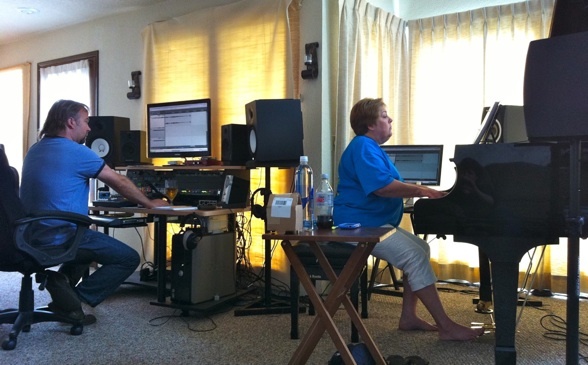 In addition to composing and recording, Cathy is the pastor of THREE churches in West Tennessee! 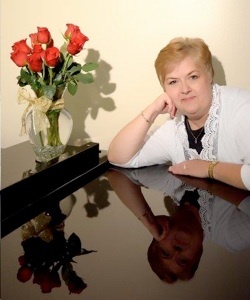 She and Rhonda Mackert will be making their concert debut here on March 13th, and I know you will enjoy getting to know Cathy as much as I have. We met last year over breakfast when she and her husband, Buddy, were passing through Florence, and I’m really looking forward to spending more time with her soon! KP: Hey Cathy! Are you safely back in Tennessee after your weekend at the NAMM show in Los Angeles? 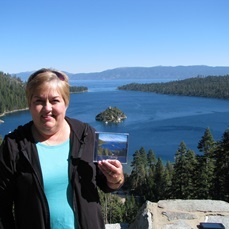 Click the album covers to read Kathy's reviews. CO: Well, I’m back, but not so sure about the “safe” part. We had tornado warnings all night last night and are supposed to have snow tonight. That’s good old Tennessee weather for you! KP: Yikes! That makes the Oregon Coast sound pretty tame! It sounds like you’re going to be jetting back and forth around the country quite a lot this year! Is your next trip the one to play here in Florence, OR and then up to the David Lanz retreat in WA in March? CO: Yes, that’s my next trip. Rhonda (Mackert) and I will be doing the concert at your house on the 13th and then we’ll go on up to the David Lanz retreat. Then I will be doing a concert near Portland with Donovan Johnson and Renee Michelle on Sunday night. 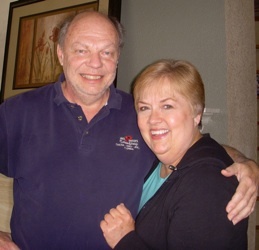 Then it’s on up to Rhonda’s house in Gig Harbor, WA for a house concert on her new piano and then back to Tennessee. I’ll be in Omaha, NE with Donovan and Matthew Mayer at the beginning of April and then in Knoxville,TN at the beginning of May. WHEW! Then I’ll have a little break before I fly to Sedona to record my next two CD’s and then on to a tour of TX and hopefully a few concerts with Rhonda Mackert, Michael and Kendra Logozar and me in the Lone Star state in the fall. KP: That should be pretty intense! It sounds like you’ve been playing the piano for most of your life. Tell us a bit about your music background - when did you start, where did you study, etc. CO: I had a bit of a rocky beginning in music. When I was 5, we had an old upright piano. My mother thought I should start lessons. But my teacher would give me one little piece and I would have it memorized by the second or third day and get bored. The second or third time my mother found me laying on the piano bench trying to play with my toes, she got frustrated and sold the piano! After that, I taught myself by playing hymns while at church and so forth. I began lessons again in the 9th grade, but once again, quickly got bored. By that time, however, I was the accompanist for several high school choirs and I was involved in band. I was hooked and knew that I would do something with music. I majored in music at West Virginia Wesleyan College, a small private school in the tiny town of Buckhannon, WV. It’s a beautiful place set in the foothills of the Appalachian Mountains. I was a music theory and history major, but it took me two years to decide whether I wanted to focus on piano or voice. I finally declared piano as my applied major. My professor said that I didn’t really make a choice – I just decided to “sing on the piano!” That’s still pretty much my style. I write melodies. The rest just follows. KP: When did you become a pastor? 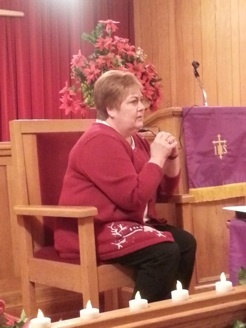 CO: I have been in music ministry most of my life, but I became a pastor three years ago. KP: How do you manage being the pastor of three churches at once? CO: Very carefully! The churches that I pastor are actually about an hour and a half (75 miles) away from where I live. So during the week, I’m available to my people via phone and internet unless someone is sick or needs me to be physically present for whatever reason. But on Sunday mornings, my husband, my daughter and I drive over there and I preach at 9:00, 10:00 and 11:00. When we begin the last hymn, Buddy goes out and gets the car started and after we finish, I hop in and we’re off to the next church! It’s 9 miles between the first and second church and 12 miles between the second and third. I jokingly say that we have an agreement with the sheriff’s department. If he sees a little blue Toyota Highlander flying by, just ignore it or wait for me outside the church! KP: Wow! That must be quite a sight - and what dedication to do that every week! Have you been in music ministry for a lot of years, too? CO: Yes. I really began music ministry when I was still in high school. But during college, I was the choir director at a local church. I’ve always served in one way or another in the music department of whatever church I was involved in. But nearly 20 years ago, I became the music minister at our church and I’ve pretty much been doing that ever since. KP: Do you still teach piano as well? CO: I have taught piano for – well, forever! However, when I took the three churches, I stopped for a while. I am just now beginning to take students again. KP: When did you start composing music? KP: That’s really amazing! You’ve said that once you started composing, the music just kept coming. Is that still a constant process? CO: It is. I nearly drove myself crazy at NAMM because I had this piece going around in my head and I couldn’t get to a quiet piano to write it down! I guess I need to start carrying a little, portable keyboard with me or something! KP: Can you hum it into your phone or something? CO: I tried that once when we were at Crater Lake. I guess I lost it or it never recorded or whatever. I am SERIOUSLY technologically challenged. It’s a miracle that I can even answer my phone! But I do need to find some method of saving these ideas that pop into my head at inopportune moments. I actually got the melody for “A Tender Soul” while I was preaching one Sunday morning. I’m not sure that my folks would be particularly fond of me pausing in the middle of a sermon to jot down a melody! I whistled that one all the way home from church and wrote it that afternoon. KP: What inspired you to start composing? CO: As I said, it was really an attempt to prove that I was right – I had NO talent for writing music. I was really trying to get my husband to stop bugging me about it. KP: Sounds like a win-win! What made you decide to study with Joseph Akins? I love his music and he’s such a great guy! CO: Joseph was always at the concerts we attended at Philip’s. And I think my husband actually talked with him first about lessons. That man is ALWAYS getting me into trouble! (My husband, I mean!) And yes, Joseph is AMAZING! I love his music. And the man has some kind of magic wand or something. When I get stuck or feel uninspired, I go over to Joseph’s house for a session with him. Sometimes we talk and laugh more than we work. But every time I go over there, I come home and write three or four new songs in a week! KP: That’s really good to know! You released two CDs in 2012, Like a Song, which is originals, and Let There Be Joy, which is a combination of traditional Christmas songs and your own originals. What’s next? CO: I am working on at least three projects right now. I hope to record two CD’s later this year at Piano Haven. One will be another original and the other will be a collection of hymn arrangements. I’m also working on a collection of Appalachian tunes – a kind-of return to my roots. KP: Those all sound great! Who and what do you consider to be your main musical influences and inspiration? CO: Wow! There are so many! I love listening to all my colleagues in the solo piano genre. Of course, I am influenced by David Lanz, David Nevue, Louis Landon, Michael Dulin, Joseph Akins and Joe Bongiorno. Who isn’t? But if I could choose one person that I would like my music to sound like, it would be Christine Brown. I just LOVE her music. It sings to me! 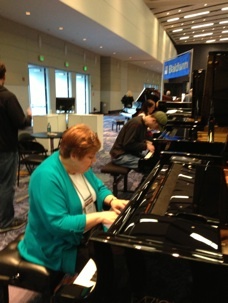 But then, I went to NAMM and heard Michele McLaughlin in person and the amazing touch of Chad Lawson. Good grief – I don’t even know what I’m doing in a group that includes all of these amazing folks! Rhonda Mackert and I have just connected like we’re sisters from different mothers or something. And we keep each other on the straight and narrow when it comes to our music. We don’t let the other one get down on herself or give up. We’ve gotten very good at giving one another that proverbial kick! In nature, my inspiration is water. Put me anywhere that I can see or hear water and music just flows out of me! (No pun intended!) Maybe I should get one of those little indoor fountains to sit somewhere near my piano. And, of course, my faith inspires me to write. Probably more than anything else, my music is praise. It may not sound like hymns or praise songs, but to me, it’s all prayers on my piano. Test-driving the Faziolis at NAMM. KP: Who are some of your favorite performers? CO: Once again – SO many! LOVE watching Joseph Akins perform. That man could be a one-man piano-comedy act. He is not only a pianist, he’s an entertainer! Of course, Michele is an amazing performer and I could just sit and watch Chad Lawson play all day long. His technique and touch are phenomenal. Love to watch Michael Dulin. That man has 20 fingers on each hand and each one is at least a foot long! David Lanz and Louis Landon are both incredible and funny to boot! And David Nevue……… How many do you want me to list? KP: I know. I could go on and on, too! Who are some of your favorite composers? CO: I love the power of Beethoven, the lightness of Mozart, the beauty of Chopin and Schumann. Love to listen to Bach – HATE to play it!! I love listening to different composers depending on my mood or the task at hand. If I’m doing something that requires concentration and organization, it’s gotta be Baroque. If I need to relax, it’s the Romantic period. If I need to be motivated, it’s Classical. KP: We should compare record collections! Where did you grow up? CO: My mother used to have a beautiful voice (she’s 85 now.) My daddy played harmonica and sang a little. I remember my grandmother having a beautiful alto voice from standing next to her at church. And when I was little and was afraid, she would sit with me in the rocking chair and sing the old hymns to me. That’s one of my favorite childhood memories. But that’s pretty much it. I don’t think anyone else in my family was musical. None of them were trained at all. KP: Your husband, Buddy, seems to be acting as your manager. It’s great that he’s so interested and involved in your career! How long have you been married? CO: We have been married for 7-1/2 years. And yes, he is AMAZING!!!! He actually started this whole thing and he keeps me “on task” and focused. I NEED that! I think I’m actually his retirement plan! I’m good with that! The night Cathy became the newest Whisperings Artist. 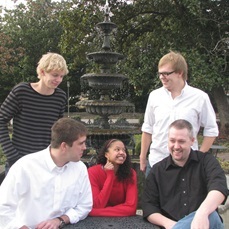 From left: Louis Landon, Amy Janelle, David Lanz, Joe Bongiorno, Cathy Oakes, and Rhonda Mackert. KP: What has been your most exciting moment or event so far? CO: It was an incredible honor to have my Christmas CD nominated for Holiday Album of the Year by solopiano.com. And NAMM was amazing! But I think the MOST exciting and one that will stay with me for the rest of my life was the day I received word that David Nevue was going to include me in the Whisperings group. I was in Seattle recording my Christmas CD. Buddy, Rhonda and I were riding through Gig Harbor looking at the beautiful sights. And I got a message from David! I remember crying when I got that. I NEVER cry! It was so special to be there with music friends! 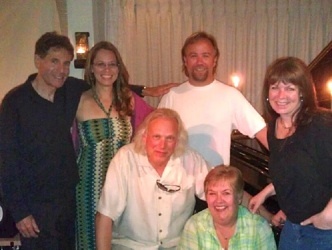 And then, that night, we went to Piano Haven to hear Joe Bongiorno, David Lanz and Louis Landon. That would be in the top ten list of favorite days in my life! KP: Whew! I guess so!!! Is there a particular philosophy that you try to convey in your music? CO: I always pray that God will use my music to touch someone and minister His healing or comfort or peace to them through the notes and the melodies. Like I said, for me, it’s all prayers on the piano. And I want to convey hope. I write from the experiences of my life. I’d like others to know that no matter how dark or difficult their path may be, there is ALWAYS hope. I’m living proof! There is ALWAYS hope! KP: That’s wonderful, and something a lot of people need to be reassured of. Do you have sheet music of any of your pieces yet? CO: I do. My wonderful husband gave me the most amazing Christmas gift. He had all 27 of my pieces transcribed for me. So it’s all available individually or in books. We are currently working to make it available on my website. Buddy has been talking to Tim Neumark about his Neucart program. Hopefully, we will have all of that up and running VERY soon. But, in the meantime, you can order it and I will email it to you in PDF form. KP: Do you play any instruments besides piano? CO: Goodness. Of course, I play the organ (although I don’t like it!) and I play guitar (not very well) and all the woodwind instruments. I started in band on the clarinet and progressed to saxophone (alto, tenor and baritone), bass clarinet, E-flat clarinet, etc. And I have two dulcimers that I’m supposed to be learning to play. It hasn’t happened yet, but I think you actually have to take them out of the case first! One is a mountain dulcimer and one is a hammered dulcimer. And I have an Indian flute that I torture my puppies with from time to time. KP: A one-woman band!!! Do you still do a lot of singing? CO: Not so much anymore. Since I began preaching, my voice has steadily gotten grainier and grainier. I am hoping that it will come back eventually. CO: For me, I would like to be able to move to Lake Tahoe. We plan to do that eventually. I would like to be able to make a living at my music and I would like all five of my children to be Godly, responsible and independent young people. But beyond the personal, I would wish for all children to have a loving, safe home, for all animals to have food, shelter and love (yes – I AM an animal lover) and for the craziness that has overtaken our nation to be turned around (no more shootings, no more violence). KP: Is there anything else you’d like to talk about? I’m very open to suggestions! CO: I would like to thank you for all your support and for allowing us to invade your home and to share our music with you and your friends! KP: I’m really looking forward to it!!! Recording at Piano Haven with Joe Bongiorno. 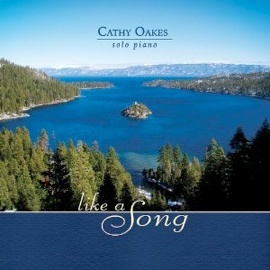 For more information about Cathy Oakes and her music, please visit her Artist Page here on MainlyPiano.com and her website.